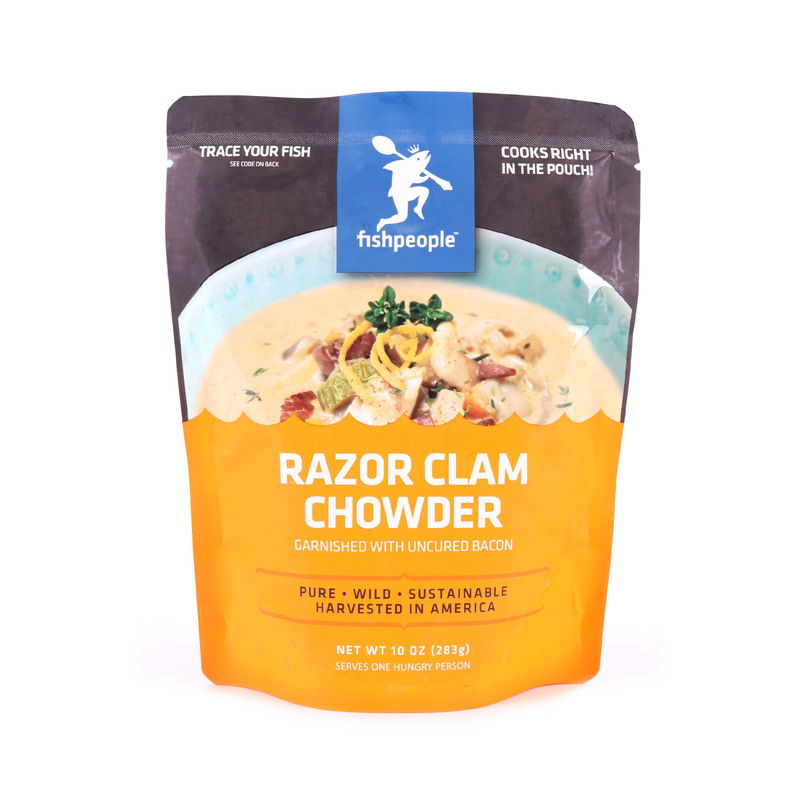 A hearty chowder that combines succulent West Coast razor clams, hand harvested by the Quinault Indian Nation on the beaches of Washington state, paired with scrumptious bacon nibbles, fresh cream and fragrant thyme. Water, cream, onions, potatoes, sea clams & sea clam juice, razor clams, carrots, celery, Neufchâtel cheese (pasteurized milk and cream, skim milk, cheese culture, salt, stabilizers [carob bean and/or xanthan and/or guar gums]), uncured bacon (pork, water, salt, sugar, celery powder, may contain: brown sugar, vinegar, lactic acid starter culture, spices), corn starch, lemon peel, citric acid, thyme, extra virgin olive oil, anchovy sauce, salt, sea clam broth concentrate, lemon juice, yeast extract, maltodextrin, black pepper, smoked paprika, bay leaf, cayenne chili pepper. 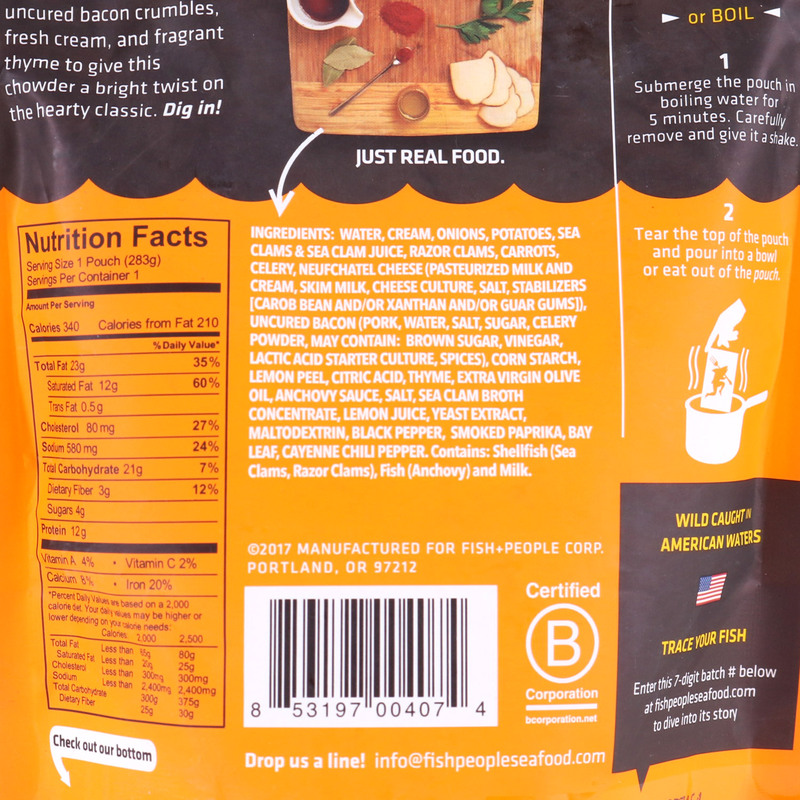 Contains: Shellfish (sea clams, razor clams), fish (anchovy) and milk.